"The War Memorial consists of a large and beautiful oak tablet on the north side of the vestibule. 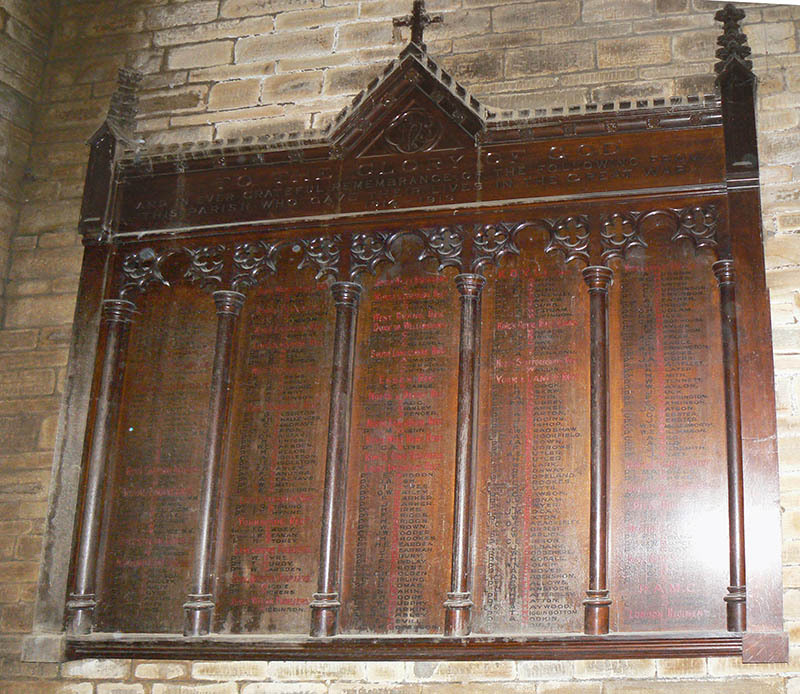 Five panels contain the names of 223 men of the parish who gave their lives in the Great War. It was erected at a cost of £206." An impressive Service was held at St Silas yesterday when a memorial tablet commemorating 223 of the Parish who gave their lives was unveiled by Lt. Col. W. Middleton. R.E. Those men who managed to stick at home and in some cases to heap up a very comfortable capital would go on living their fat times, but they would never be truly happy or partake of the glory that would be the lot of the men who gave their lives, but found life. The Vicar Rev. W. Peter Wright said the prayers and the lesson was read by Rev. G.H. McNeal (Sheffield Wesleyan Mission) and Rev. A.G. Jones Vicar of Curbar, former curate at St Silas.